Funded by the Government of Japan, the Agency for Meteorology, Climatology and Geophysics of the Republic of Indonesia (BMKG) and United Nations Economic and Social Commission for Asia and the Pacific (UN ESCAP) held 3 weeks training on National Multi-Hazards Early Warning System with Geospatial Applications for Disaster Risk Reduction and Sustainable Developmentfrom July 10th until August 2nd, 2017, at the WMO Regional Training Center, Citeko, Indonesia. 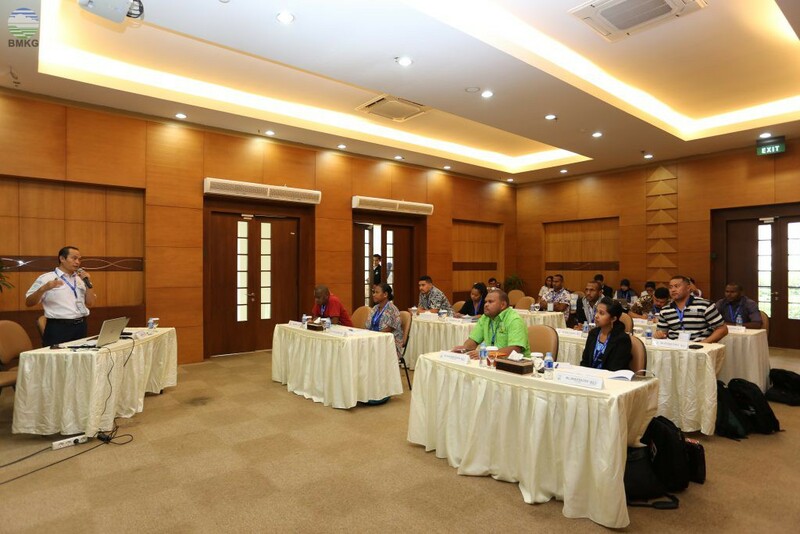 The trainees consist of 12 participants from 6 Pacific Island Countries (PICs) representing each National Disaster Management Office (NDMO) and National Meteorological and Hydrological Service (NMHs). Jakarta, Indonesia -The Pacific region is known to be one of the most exposed regions to a wide variety of natural hazards in the world. Some of these hazards will be exacerbated by climate change and tsunami. All of these of course adversely affects agriculture, fisheries, coastal zones, water resources, health, and ecosystems and in turn threaten entire communities and economies. The fundamental precondition for developing a national disaster risk reduction is availability of well-functioning early warning systems that deliver accurate, reliable and understandable warnings, in a timely manner, to authorities, operational disaster managers and populations at risk, to enable early actions to reduce the impacts of potential disasters. A multi-hazards approach in the risk assessment could result in enhanced operational effectiveness, cost effectiveness and sustainability of early warning systems through building on and complementing existing early warning systems capacities, infrastructures and activities of various stakeholders. Recognizing this crucial issue in the Pacific Region, BMKG and UN ESCAP have synergize efforts of both parties in promoting disaster risk reduction in the Pacific region with a Letter of Agreement (LoA) signed in 2016. Through this partnership, BMKG supports the ESCAP Regional Network of Knowledge and Innovation Centers in Disaster Risk Reduction by providing specialized training and technical advisory expertise tailored to the needs of high-level policy makers in each of the recipient countries. Under the LoA, BMKG in collaboration with the UN ESCAP conduct a Project on Strengthening Multi-Hazard Risk Assessment and Early Warning Systems with Applications of Space and Geographic Information Systems in Pacific Island Countries funded by the Government of Japan. This training is a part of activities conducted under the Project beside other activities such as gap and needs analysis on multi-hazard risk assessment and early warning, implementation of the pilot project on multi hazards early warning system, and development of the Strategy for Sub-Regional Hub and Network in RSMCs. Dr. Andi Eka Sakya, Director General of BMKG, during opening ceremony said that this training was held to support the Pacific region countries in terms of enhancing knowledge and capacity on multi-hazards early warning system by using geospatial technology and data. Samoa : Development of Geo-portal System 3 (three) of the work plans will be chosen by BMKG and UN ESCAP as a pilot project to be technically assisted on its implementation.